Originally from North Carolina, Cliff played trumpet in a variety of styles from concert bands to marching bands, church music with organ to orchestras, swing dance bands and jazz ensembles. He joined his first brass band in college and continued to play with brass bands through graduate school. Now a proud member of the Mission Peak Brass Band, Cliff is pleased to play a wonderful Ellington tune, Isfahan from the Far East Suite, arranged for Flugelhorn. Cliff has performed with a number of groups in the bay area, including the Redwood Symphony in Redwood City, Master Sinfonia in Los Altos, San Jose Wind Symphony, Don Haneke Chorale in San Jose, Palo Alto Philharmonic, and the Ohlone Community Band. 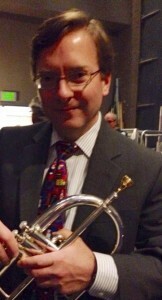 He currently performs regularly with the Ohlone Wind Orchestra as well as the Mission Peak Brass Band.